It was 2:45 in the morning and a voice inside my head rang out telling us it was time to get up and prepare to depart. I thought it was a dream. As my eyes began to open, I realized that I was very wrong. Our time in Two Rivers was over and it was time to prepare the ship for the sail home back to Discovery World in Milwaukee. SO hard to believe we were nearing the end of our incredible journey! Our duties were far from over and we soon were mustering (gathering) near mid-ship to hear the Captain’s instructions for our departure. Ready to work in the early, early morning! First Mate Johnny began to yell out orders and we sprang to action, began pulling bumpers in (these protect the boat while in dock and readying to receive and hoist in the small rescue boat (Eve), used in aiding landing and departure. 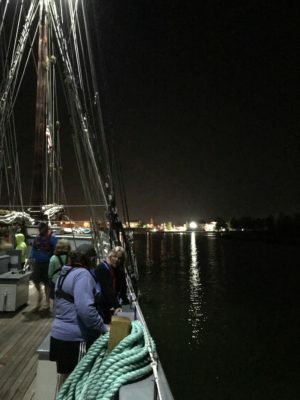 By 3:10, we were on our way out of the harbor readying to hoist sails. We’ve learned this week that teamwork and good listening are essential skills to ensure that everything happens efficiently and safely. Not a far cry from what we expect of our students as educators. What this journey soon reminded us of was that we too were students. We needed constant modeling and a lot of time to practice the skills we were expected to perform. Many times we failed before success was at our fingertips but at the base of our experience was the fuel for our success; laughter and fun! 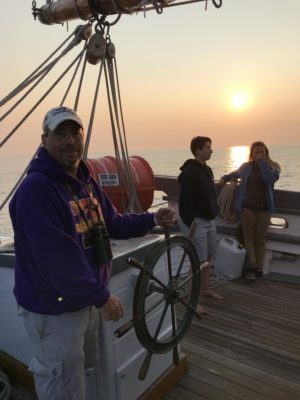 The crew of the S/V Denis Sullivan is outstanding and are true professionals at their craft. At this point of our journey, we all were more familiar with the boat and confident with our duties as ship hands. Then came Johnny’s commands; “Hoist the Mizzen”, “Hoist the Mainsail”, “Hoist the Foresail” and we were on our way. Course set at 200.0 degrees but with a SSE wind of only 5.6 knots we needed to be under engine power too. It took about 13 hours to make the journey back to Milwaukee, giving us time to reflect on all we’d learned–and learn a little more too! We had breakfast after our watch and grabbed naps afterwards. We had the morning to meet with our mentors (or mentees!) and collaborate with other educators. This is rare in education, so we relished every opportunity. After lunch, we gathered our belongings and packed up. 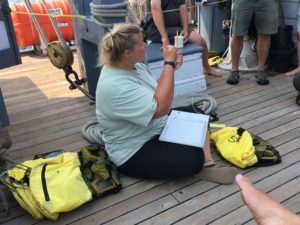 Then, Tori taught us how she and her colleagues map shipwrecks in the Great Lakes. We continue to be fascinated by the history, geography, archaeology and even biology of shipwrecks! 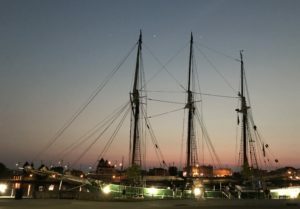 Our final adventure was that those of us who wanted to climb to the top of the masts had the opportunity. It was definitely a growth experience and had us at the edge of our comfort zones. 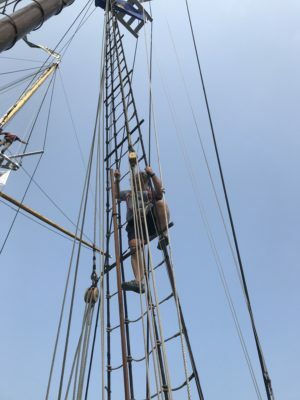 At 3:49 p.m., as we took our turns on the rigging, we entered the Port of Milwaukee and the S/V Denis Sullivan (and her crew!) returned to their home.